Small and medium-sized businesses outscored larger companies in managing their corporate social responsibility reports — but all sizes of firms could improve CSR management and remove more risk for their companies, according to EcoVadis’ second annual study of more than 33,000 businesses around the world. Out of 100 points, small and medium-sized companies (26-999 employees) scored 42.4, and large ones (more than 1,000 employees) scored 39.6, the study said. Results below 45 indicate “an unstructured approach” to CSR management — with a medium to high risk for a business on the EcoVadis scoring scale, and the study said large companies have much further to go in improving their CSR practices, EcoVadis said. This is EcoVadis’ second Global CSR Risk and Performance Index, which measured 21 criteria across four themes: environment, business ethics, sustainable procurement, and labor and human rights issues. The report, released in September, analyzes data from 2017. The first study looked at data from 2015–2016, and EcoVadis uses all three years to draw conclusions about changes over those years. For 2017, the “business ethics” theme improved the most. That area focuses primarily on criteria for corruption, bribery and information security. The improvement is likely a result of increased efforts by companies to align with national and international legislations, including the E.U.’s General Data Protection Regulation (GDPR), the report says. The themes “labor and human rights” and “sustainable procurement” stayed level. They cover a number of aspects, including working conditions and human rights of both employees and the community. One development in the sustainable procurement level shows promising signs. The theme measures how companies are engaging their own supplies on sustainability topics. 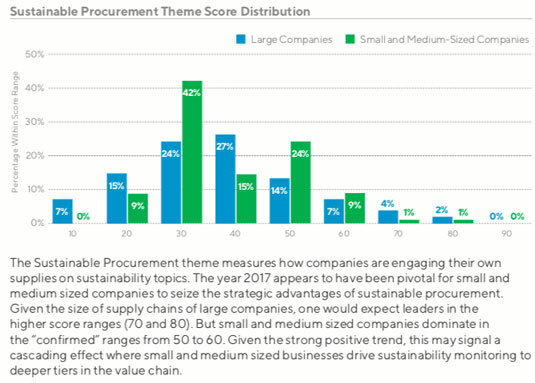 The year 2017 appears to have been pivotal for small to medium-sized business (SMBs) “to seize the strategic advantages of sustainable procurement.” Given the size of supply chains of large companies, EcoVadis expected leaders in the higher score ranges (70 and 80). But SMBs dominate in the “confirmed” ranges from 50 to 60. “Given the strong positive trend, this may signal a cascading effect where small and medium sized businesses drive sustainability monitoring to deeper tiers in the value chain,” the report said. Scores for the “environment” theme, which includes monitoring of greenhouse gas emissions, “went down in most regions, suggesting that businesses may have had difficulties to work on the goals set in the Paris agreement.” But the scores went up in the U.S. despite the federal government relaxing its environmental regulations and pulling out of the Paris agreement, the report noted. Small and medium-sized businesses account for about 80% of the organizations assessed by EcoVadis, which also broke out data by regions. In the U.S. and Canada region, SMBs scored 44.3 and large companies scored 40.8, the report said. In a breakdown by industry, small and medium-sized food and beverage companies were the best-scoring division globally, with an overall CSR score of 46.8. Advanced manufacturing companies were performance leaders for the large-size group, with an overall score of 44.2. The report notes a positive trend: If businesses have begun CSR reporting, they tend to improve their efforts each year — although American and Canadian firms underperformed the global average. Of the companies that EcoVadis reassessed a second or third time for its index, over 60% in most regions improved their score, and roughly 15% to 17% maintained their scores. Small and medium-sized companies in the U.S.-Canada region were third worst (after China) on this measure, with only 49% improving their score and 26% keeping the same score.